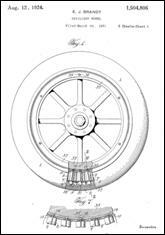 1889 FOUNDED by Edward J. Brandt along with several other investors. The company has played a key role in Watertown’s industry since that time. 12 18 BRANDT CASHIER MANUFACTURING CO. / BRANDT-DENT CO.
Brandt Automatic Cashier, 507 & 515 S. First St.
Brandt shipment to A. B. Affarssytem of Stockholm, Sweden. 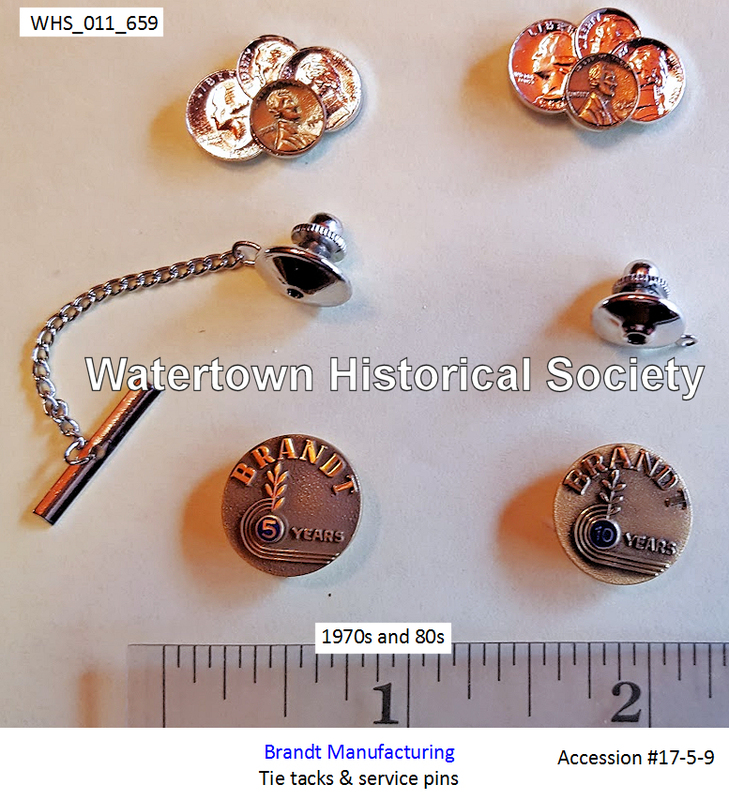 Quite a number of years ago the founder of the present Brandt Manufacturing Company was employed in a local bank [Bank of Watertown] where it was necessary for him to pay out various items usual in banking transactions, over the counter. In addition to this he was required to make up the payroll for a railroad employing a very large number of men. These latter payments, together with the regular transactions of each day, made the total of small coin payments so great that it was a considerable mental strain. Moreover, the likelihood of error was always present. The thought suggested itself that a mechanical means of dispensing silver and pennies would be a tremendous saving of time and labor. Mr. Brandt had from time to time constructed mechanical devices as a pastime after banking hours. Among these was a miniature old-fashioned flour mill with an overshot water-wheel. Disposed about the mill were various moving figures such as customers, a fisherman, and also sitting in the shadow of the mill, a young couple. The mill with its mechanical figures was placed above a large aquarium. The whole was propelled by a weight. The water was drawn from the aquarium and as it ran over the wheel turning it, it was apparently driving the mill. In the working out of this and similar interesting but non-essential devices, the thought became more pronounced that the counting and paying of money, mechanically, would be an excellent subject to work upon. The idea once conceived it was merely a matter of a few days to crystallize a general principle for carrying it into effect. It took one year, however, to work out in detail and produce the first machine to be used commercially. So thoroughly and accurately was this first model constructed that it is still in use in one of our local banks. This pioneer machine has now passed its twentieth birthday. The object of the machine was to make a given payment of change or gold by the depression of a single key, thus eliminating the work of selecting the coins necessary to make the payment. For instance, when the key 87 is depressed the machine delivers the least number of coins necessary to make the payment and in this case these coins would be in a half dollar, a quarter, a dime, and two pennies. Computation is unnecessary and as the machine selects the coins and delivers them it can readily be seen how important the machine is to the business world. In the case of the changer machine the difference between the amount tendered and the amount of the purchase is automatically returned without computation. For instance, if a dollar is tendered and the sale is 13c the machine returns the correct change by simply depressing the 13th key, computation being unnecessary. 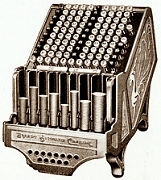 As the Brandt Automatic Cashier was the pioneer in its field it took years to establish it as one of the standard equipments in use in the business world. The sale of the machines has, however, gained momentum in recent years and there are between four and five millions of dollars worth of the same now in use. The plant here is equipped with a large number of special appliances to make the different parts of the machines and one hundred employees, under competent foremen, are necessary to keep this machinery in operation and to assemble the parts made. The office force employed in the factory office and in the main office on Main Street, number thirty. The general offices for conducting the business have been variously located in New York, Washington, Chicago and Watertown. It has been necessary in the more recent history of the business to occupy an office building here located on Main Street and from this point the business is conducted through various offices in New York, Washington, Boston, Pittsburgh, Philadelphia, Atlanta, Minneapolis, and other points. These offices are controlled by District Managers who report to the home office here. There are fifty men employed in the sales force. 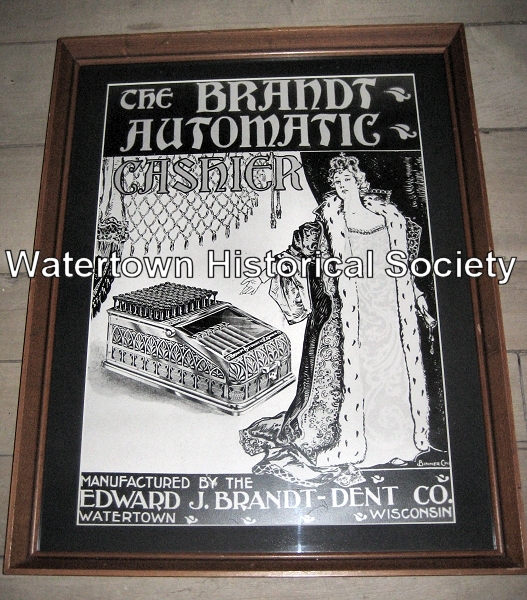 The Brandt Automatic Cashier Co. of Watertown, established in 1890, is observing its 75th anniversary, the official beginning of which is on Saturday. Established by the late E. J. Brandt, who is credited with being the inventor of the first coin-paying device, the firm has developed into one of the world’s leading producers of coin handling machines. 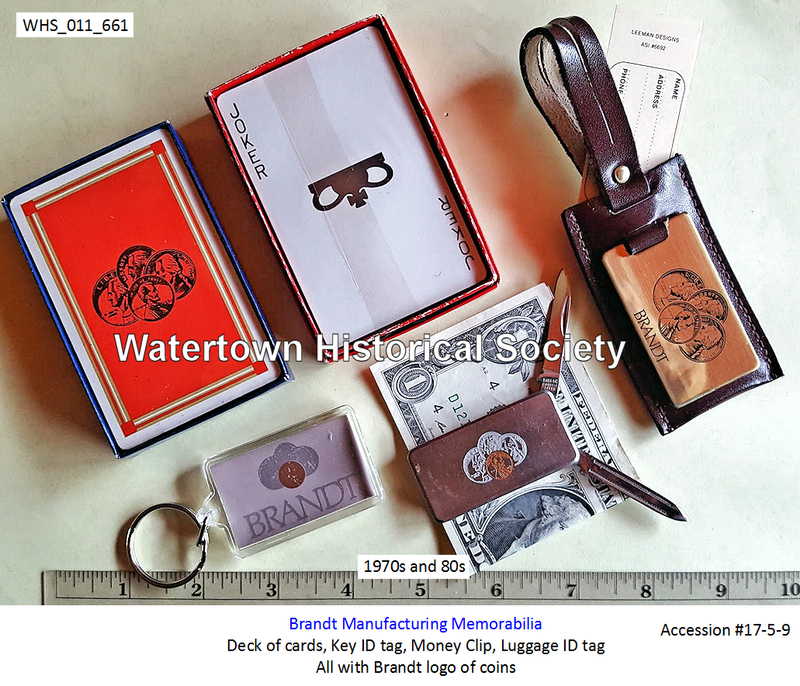 Embracing a full line of electric and manually operated change-making and dispensing machines as well as coin sorters and coin counters, the Brandt firm is housed in three installations in Watertown. The most recent is a manufacturing facility covering 71,000 square feet of space completed in 1959. John R. (Jack) Erdmann of 112 North Montgomery Street has been appointed sales promotion manager of the Brandt Automatic Cashier Company, according to an announcement by E. James Quirk, president of Brandt. Mr. Erdmann’s career with Brandt began in 1964 when he took charge of the company’s IBM department. He subsequently worked on several additional assignments that led to his latest promotion. 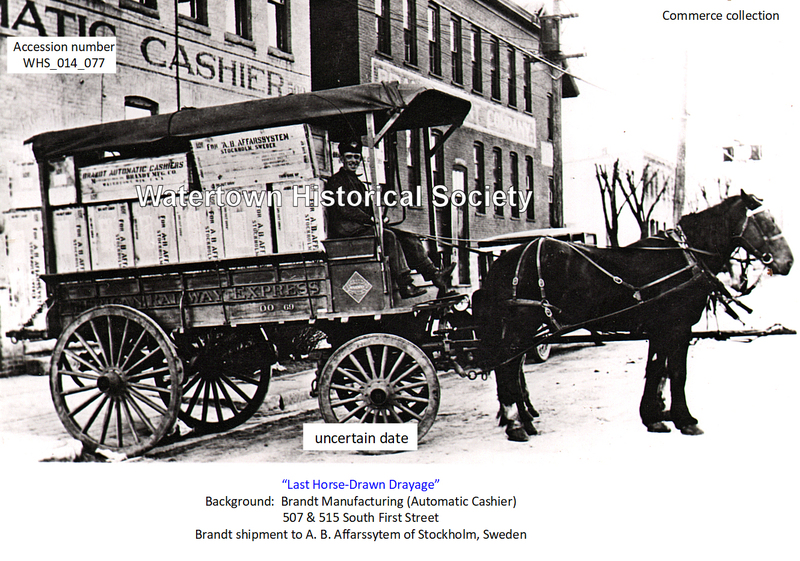 Prior to joining Brandt, he was manager of Hutson-Braun Lumber Company in this city. He had earlier been with J. C. Penney Company in Watertown. The Brandt Automatic Cashier Company held ground breaking ceremonies this morning at its plant in South 12th Street. A new office building will be constructed and present manufacturing areas are to be expanded. The new building will be built to the north and slightly west of the company’s main plant. It will be of Fond du Lac stone and will contain 13,500 square feet. Company officials, city officials and contractors taking part in the ceremony were Lester H. Rehbaum, assistant secretary of the company; Charles Wallman, vice president; Mayor A. E. Bentzin; E. James Quirk, company president, who turned the first spade of ground; William F. Kraemer, purchasing manager; William Carroll, executive secretary of the Watertown Area Chamber of Commerce; Arthur E. Radloff, secretary-treasurer of the company; Anthony Pawlowsky of the Potter, Lawson, Findlay and Pawlowsky architectural firm, Madison, designers of the new facilities; James Sievert of Dietz Electric, Milwaukee; John Mitchell of Pelikan Plumbing and Heating, Sullivan; William J. Rupnow, plant manager; Joseph Promersberger of Pro-Tel Heating, Brookfield; Russ Kammer, Madison, general contractor. Governor Warren P. Knowles spent a busy afternoon in Watertown on Monday afternoon and he was most impressed at what he saw. At noon he addressed the weekly luncheon meeting of the Watertown Rotary Club, following that, he visited the plant of the Brandt Automatic Cashier Company, Allard Express, Lindberg Hevi-Duty, the Bank of Watertown and Carnation Farms Breeding Service. At Brandt’s he spent much time touring the plant, observing the manufacturing of the various coin sorting machines made by Brandt’s. He shook hands with dozens of employees. He also visited the new addition under construction. An addition of 35,000 square feet is now being built, a portion of which will be for the new office quarters, and the other will be for manufacturing. Company remained in the Brandt-Quirk family until January of 1984 when sold to Nelson Peltz and Peter May, investors from the east coast. Brandt Inc. has been awarded a prestigious 1991 Quality Supplier Award from the U.S. Postal Service in a ceremony in Washington D.C. The award was one of 12 given by the Postal Service in four categories. Winners were selected from 60,000 firms on the Postal Service’s National Supplier’s List. Brandt won in the large business manufacturing category. Other finalists, but not winners, in the same category were Motorola Inc. of Hyattsville, Md., and Systemhouse Inc. of Arlington, Va. Ed Opperud, vice president of manufacturing coin products and operation, Watertown, said the Watertown plant manufactured 5,550 coin counters and packagers and the Bensalem plant manufactured 2,000 currency counters which were sold to the U.S. Post Office in a multimillion dollar contract. He said the equipment is being used to process money received by the post office in an efficient manner, helping to keep postal costs down. 1995 Nelson Peltz and Peter May sold business in August of 1995 to De La Rue. A corporation headquartered in Iowa has entered an agreement to acquire Brandt, Inc. The sale will not affect operations or employees at Brandt manufacturing plants in Watertown or Pennsylvania. LeFebure Corp., a subsidiary of De La Rue Company, will acquire Brandt, Inc. pending approval by United States government agencies and Brandt stockholders. The parent company of De La Rue Cash Systems, Inc., 705 S. Twelfth St., Watertown, plans to sell the local business to a private equity firm. The local firm is one of Watertown’s oldest industries, dating back to the 1800s when it was known at Brandt Automatic Cashier Company. De La Rue, Plc, the world’s largest banknote printing company, announced its Cash Systems division, which consists of the Watertown plant as well as one in Lisle, Ill., is to be sold to Carlyle Group, a private equity firm, for about $700 million cash. De La Rue, Plc is headquartered in London. The Cash Systems division makes cash-handling equipment such as automated teller machines and coin and currency counters for banks and retailers. It was put up for sale in May following a strategic review of the company which concluded the division provided little opportunity for synergies with the other businesses the company owns. De La Rue Cash Systems Inc. will soon undergo a change of ownership and will be changing its name. Effective Sept. 1, De La Rue Cash Systems Inc., which is located at 705 S. Twelfth St., will be known as Talaris Inc. De La Rue, Plc, the parent company of De La Rue Cash Systems and the world’s largest banknote printing company, is in the process of selling the local business to a private equity firm. De La Rue, Plc is selling its Cash Systems division, which consists of the Watertown plant as well as one in Lisle, Ill., to the Carlyle Group for about $700 million in cash. -- -- In September De La Rue, Plc sold its Cash Systems division, consisting of Watertown plant and one in Lisle, Ill., to the Carlyle Group. The Carlyle Group purchased the business on Sept. 1, 2008, and changed the name to Talaris Inc. In the past four years the company’s earnings have increased 40 percent as Carlyle focused on expanding the company into new markets worldwide, according to the release. Talaris Inc. outsourcing the manufacture of its coin products currently produced in Watertown to Flextronics Internationals. In addition to manufacturing, Talaris has engineering, call center, service, repair and parts depot and finance functions in Watertown. According to Reagan, while no jobs are expected to be lost this year, there will be a reduction of between 20 to 30 positions in 2011. More than 120 people will remain employed at the site. 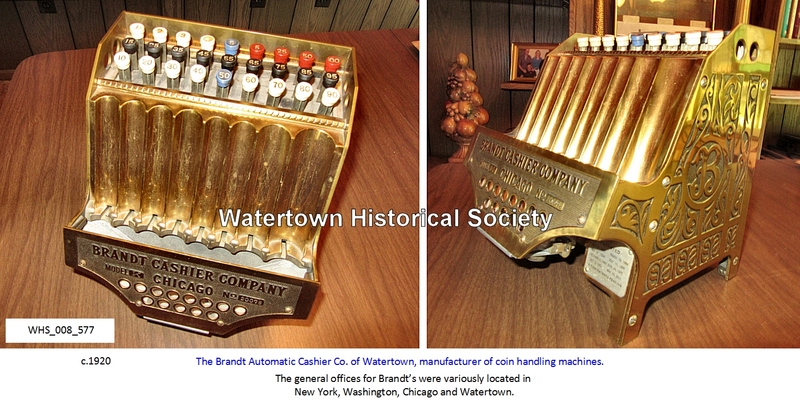 The local firm dates back to the 1800s when it was known as Brandt Automatic Cashier Co. 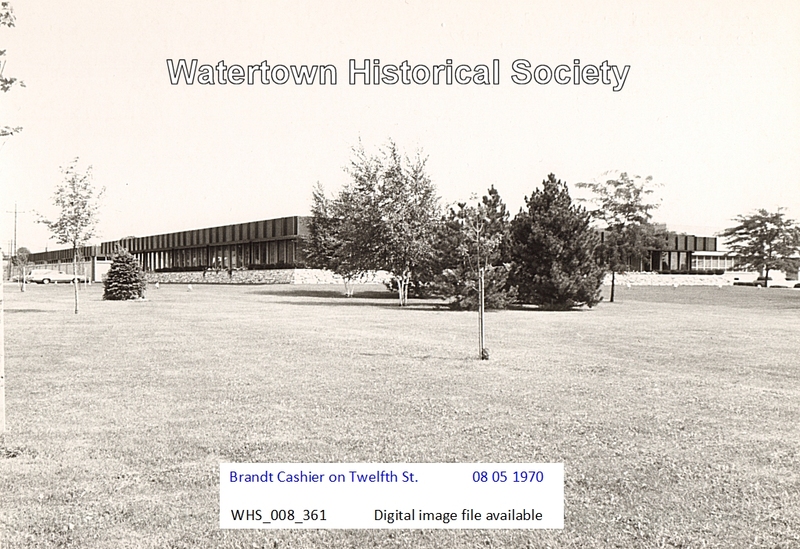 The local operation, which was formed by Edward J. Brandt and several other investors, has been a large part of Watertown's industrial and civic foundations since that time. The company remained in the Brandt-Quirk family until January of 1984 when it was sold to Nelson Peltz and Peter May, two investors from the east coast. They continued to own the business until August of 1995 when it was sold to De La Rue. In September of 2008, De La Rue plc sold its Cash Systems division, which consists of the Watertown plant as well as one in Lisle, Ill., to the Carlyle Group for about $700 million in cash. Today Talaris is a global business as a leading provider of cash handling equipment and software solutions to financial institutions and retailers worldwide. It has about 2,000 people working in more than 30 offices, including over 1,000 service and support staff. An additional network of 130 business partners increases the coverage to over 85 countries. With more than 250 patents granted across 26 countries, Talaris delivers cash handling solutions on every continent, wherever money moves. The company's new change in business includes transferring production of its coin products, which include high-speed, high volume coin counters and coin sorters to Flextronics. Flex-tronics is a leading electronics manufacturing services provider. The firm helps its customers through a network of facilities in the United States and 30 countries on four continents. This global presence provides design and engineering solutions that are combined with core electronics manufacturing and logistics services. Glory Global Solutions officially broke ground at its site on South Twelfth Street Monday afternoon, executing plans for a 25,000-squarefoot warehouse addition and other various renovations. President of Glory Limited, Glory Global’s parent company, Hirokazu Onoe flew in from Japan to join American President Chris T. Reagan and dozens of employees for the ceremony. Several civic leaders including Watertown Mayor John David also attended the event. Onoe said the company’s Watertown location has several functions, all of which will be made stronger by the additions and renovations. Glory Global Solutions remains an industry leader in money handling machines and cash management systems. Its origins stem from the Brandt Automatic Cashier Company founded in Watertown and Kokuei Machinery Manufacturing founded in Himeji, Japan. Going through a number of name changes and acquisitions over the years, the two legacy companies combined to become Glory Global Solutions in 2012. The eight-phase project will begin in July and take approximately 32 months to complete. Worked at Brandt, Inc. for 45 years, starting as a secretary, promoted to sales administration manager and later became the credit and collection manager. In September of 1977, Fae Ann was appointed assistant secretary of Brandt, Inc. She was a life member of the Watertown Hospital Auxiliary, now known as Friends of WAHS. Fae Ann was also a member of the Wethonkitha Auxiliary, historical society and Watertown Humane Society.